SAFE FOR ALL DRAINS, SINKS, AND THE ENVIRONMENT! Foaming DisposALL is the only Food Waste Disposal System cleaner that sharpens the blades while literally disposing all odors, grease, and foreign particles from the inside of your plumbing systems. DisposALL uses only environmentally green compounds and contains NO TOXIC CHEMICALS. It also uses ONLY 100% BIODEGRADABLE materials! It is the MOST ENVIRONMENTALLY AND CONSUMER FRIENDLY DISPOSAL/DRAIN CLEANER ON THE MARKET! Do more for your food disposal and pipes than just make them smell fresh. Sharpen the blades, clean and degrease the pipes, and get rid of those FOUL ODORS from rotten matter. Our foaming agent will do all this while ensuring COMPLETE coverage inside. 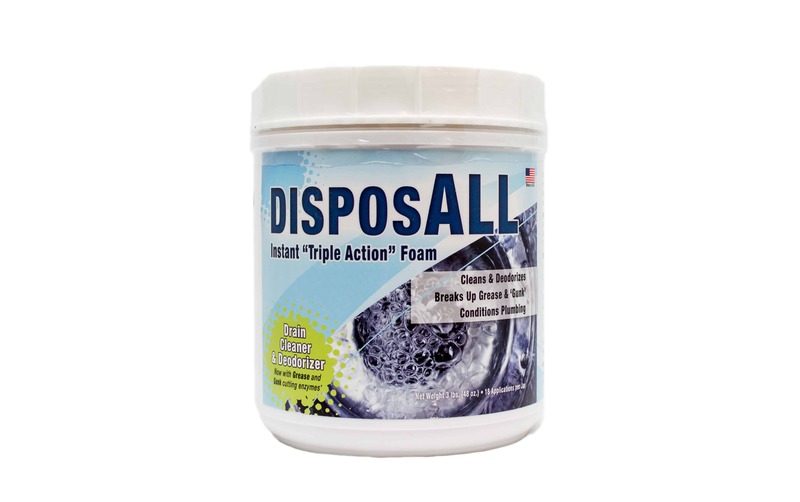 Weekly use of DisposALL has been tested and proven to GREATLY REDUCE CLOGS AND BACKED UP DRAINS! Use one full scoop (included) of DisposALL and pour directly into the opening of the sink and quickly turn the water (and disposal unit if applicable) on and off. You will notice foam flowing out of the sink openings. THIS MEANS IT IS WORKING cleaning, deodorizing and degreasing the inside of your plumbing all while sharpening your blades. Let DisposALL Foam sit and work for a minimum of 3 minutes for best results. Finally, run HOT water (you may use boiling water) down the drain to flush DisposALL through your pipes to finish its job cleaning deeper into your system. SAFE FOR ALL DRAINS AND PLUMBING!! !